Yep, another WDH "Do I need one thread"
Discussion in 'Tow Vehicles, Hitch & Towing' started by gottria, Aug 14, 2018. 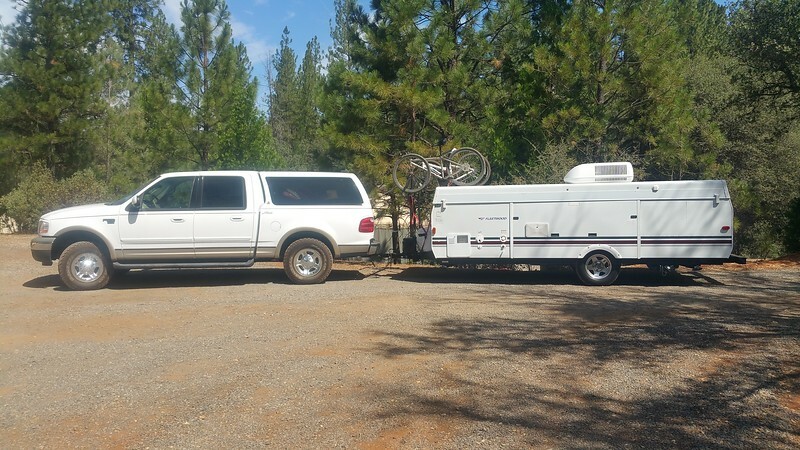 2006 Fleetwood Niagara high wall towed with a 2001 f150 Supercrew 4x4 with the 5.4L. Truck tag GVWR at 6740lbs. Trailer tag GVWR says 3770lbs. Did a rough estimate with a scale and the tongue weight comes in around 420lbs, 2 full LP tanks and 1 battery. Rear end drops about an 1.5in when hooked up. Towing with it has been very smooth with no tail wag and very little bounce. Rear sag is 1.5 inches, but what's the front doing? If you're coming up about an inch, you may want to look at a WDH just to keep it level. You could also invest in some assist springs for the F150... fairly cheap. Inch and a half is probably not even sitting the truck level I’m guessing? If that’s the case not sure why you would need one. Measure the difference of the wheel well height with and without the trailer. You don't want the front distance to rise. Or a large difference between front and rear. So why are you questioning the possible need of a WDH ? It wouldn't hurt I guess but not really needed. My truck sits level after loading up gear and hooking up the pup but rear end high when empty as with most pick-ups. Same as you, no sway and smoother ride than when empty. Here is a picture fully hooked up after a trip to Yosemite. We no longer take bikes as the kids don't think it's cool to ride bikes anymore. I'll measure tonight what the drop is and lift of the front end. The Fastway e2 I ordered came in but I think I ordered it too heavy, I got the 800Lbs tongue kit and maybe got the 600 if I need one at all now. I do think your front end looks a bit light. I would add a helper spring before dealing with a WDH. What's a helper spring? Is that similar to airbags? Edit: just googled it and I like it. Won't effect stock ride, no hastle of the wdh, and cheaper. That's why I would go that way. I had to add one back when I had a F150 with a Huge slide on camper. It looked a like your ride height but when I would go over a bridge abutment the front end would bounce so high I had no steering. Anyways I hope this helps you fix your ride. Good Luck & Camp on.